Ah! Finally you are here, Neil! I was starting to feel silly waiting for you here in the queue, in front of the theatre. Let's go in! Calm down, Feifei. You are too excited! I've been waiting for this moment for months. I love this play! My favourite actors are in it and it is so full of drama! I'm so excited! Let's go! OK… right… the tickets… (He searches his pockets) the tickets… Oh! I can't find them! What? What do you mean? Stop joking! I'm not joking! I can't find them anywhere! How could you have lost them!? How could you do this to me!? I'm so disappointed! Oh! Look, she is hysterical! Do you think she will slap him? Feifei, don't make a scene! I have to make a scene because you lost the tickets and we can't get into the theatre to watch a real scene! 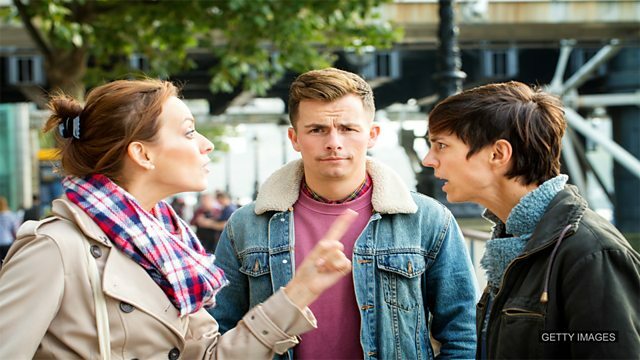 'To make a scene' is an expression we use in English to describe when somebody causes a disturbance or is loud in public. Often it’s embarrassing. I will never go back to the restaurant again. Last night Jane made a scene when the waiter brought fish instead of the beef she had ordered! It was very embarrassing. Don't make a scene, Alan! We are not married yet and I can go out with whoever I like – including your best friend! I'm sorry, Neil. I didn't mean to embarrass you or cause a disturbance. But I was looking forward to this! What's this taxi driver doing here? (Approaches them in a hurry) There you are, sir. I found these tickets on the back seat of my taxi. They might have slipped from your pocket. Oh, thank you so much! Feifei was really angry. Now, the drama is over! You mean the drama is about to start! You're the best taxi driver in the world! And you are my very good friend, Neil! You are my best friend ever! Thank you, Feifei. You are my best friend too! I'm glad we can watch the play together! Look. Isn't it marvellous? They are friends again! Let's go in. Oh, I'm so happy! Which expression means ‘causing a disturbance in public’? Complete the sentence: I wish my mother wouldn’t ____________ every time she gets bad service.